A silver cross for hanging over baby's crib is 'the' classic baby christening gift and always a good idea - as long as baby does not get several of these... A silver wall cross is a special addition to any baby's room and a gift to be treasured for many years. Other sterling silver baby gifts are classic baptism gift ideas, too. Browse here to see more silver baby gift ideas. This lovely gift set contains of a Pewter crib cross to hang to the nursery wall and a little bible with white leatherette that contains 20 stories from the Old and New Testament. The Jewelry Adviser Gifts Birth Certificate Holder Memory Set is a classic keepsake gift for baby's baptism! The box includes a silver plated birth certificate holder, a first tooth box and a first curl box. Simply perfect to give as a baby Christening gift! This will be a gift to keep until baby is a bit bigger. Give it to baby's baptism and the child can wear it at his or her First Communion or Confirmation! Cross pendants come in all styles and sizes, with or without necklace and in gold or silver. They can be quite plain or with an accent diamond or birthstone. 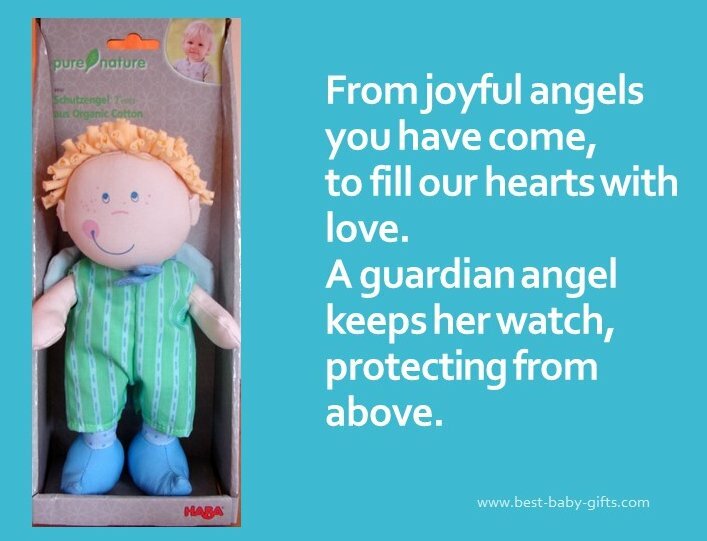 A great religious baby gift to cherish for years to come! This very cute and super soft little plush lamb has embroidered facial features and a neck ribbon with the message 'Jesus Loves Me'. It also plays 'Jesus Loves Me' and is surface washable. An awesome christening baby gift by GUND. If you are a very close relative (grandmother, grandfather) or the godmother, godfather of the baby, giving the baptism gown for baby is a nice gift idea, too. However, it is probably better not to buy the outfit on your own but rather let the parents (or at least the mother) decide. You can either accompany them when they shop for the gown and then pay for it directly, alternatively give them a gift card for a baptism outfit in advance. 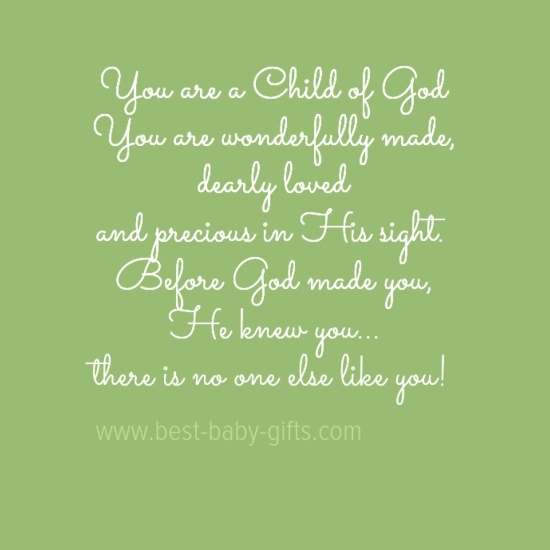 You are a child of God. You are wonderfully made, dearly loved and precious in His sight. Before God made you, He knew you... There is no one else like you! Learn here how to make a (religious) homemade baby book gift basket. Suitable for boys and girls, an amber teething necklace makes a great baby christening gift. Amber is renowned for its healing and calming influence for a long time already. It is Europe's oldest gemstone and a natural remedy used for mental and physical well-being. In the Middle Ages amber was one of the most important drugs and until today amber is found in homeopathic remedies to relieve pain. For babies and toddlers amber is used to soothe teething pain, ear aches, an upset stomach and a sore throat. Moreover it is said to calm anxiety and it also serves as an anti-spasmodic. If you are worried about strangulation, let baby wear an amber anklet or bracelet instead. Double-wrapped, the amber necklace can be worn as a bracelet or anklet. Alternatively buy the appropriate size for baby's arm or foot right away, there are special teething bracelets and anklets available as well as (gift) sets consisting of a necklace and a bracelet. A special Christening photo album is perfect to preserve the precious moments of baby's christening / baptism. It is a great keepsake to remember this special day in baby's life. The white christening album by Simply Charming is prettily designed. The front cover has a satin ribbon with 'my baptism' printed on. The album is 4 x 6 and holds 36 photographs. This is such a thoughtful and lovely christening gift idea to always cherish and remember that special festivity. A tooth fairy pillow is an adorable baby baptism present both for girls and boys. Find everything about tooth fairy pillows and boxes, just click the photos. A wagon to pull baby along to the park or to use for other outdoor activities always is good fun. See multiple kids wagons and what they have to offer here. The German based company STEIFF do have a vast offering of ever so cute baby plush toys, teddy bears and animals. By giving a STEIFF gift, baby will have a baptism keepsake for a lifetime. Steiff also offers a cute range of collectibles and limited editions so your gift might be the beginning of a Steiff collection. Opt for the snuggly lamb comforter blanket that can even be personalized or take a classic teddy bear - your christening gift will be loved and treasured for sure! What to write in your Christening congratulations card: baby bible verses, religious baby poems and sample messages.